Replacement:SEN-11931. We've updated a few reported issues with this board, go check out the new version! This page is for reference only. Will Sparkfun be making more of these? I like the tiny size versus the SEN-11931 breakout. Currently, we won't be. The new revision is larger to accommodate the mounting holes on the board, to enable a more secure connection. However, this may be something we change in the future depending on user feedback (just as this was changed in the new version to accommodate the mounting holes). Am a newbie in PIC programming. I recently purchase this tmp102 breakout board for my school project. Am trying to read the temperature register with PIC16F877A using CCS Compiler. I connect the SDA and SCL to the SDA and SCL pins of the PIC respectively and ADD0 to ground. The tmp102 is powered with 3.3vcc. Everything went weird as what am getting is 255(0xFF) and 255(0xFF) for the MSB and LSB respectively. This might not be the appropriate place to post this challenge, but has any one done something related to this or can link me to other resources? This sensor is incredibly stable. I have used and abused it while experimenting (dropping it, etc), it is still going strong. Being digital, it is not necessary to take an average of 5 or so readings as is commonly done with analog sensors. IMO the easiest to use as far as code goes (maybe tie with the TMP36 or a thermistor). I have an Arduino mounted (in a box) on the outside of a snake cage, connected to this sensor placed in a box inside the cage. I use the Arduino to control heating (Arduino output to an NPN transistor circuit to a zero-volt-turnon SSR and LED for status.) Works nicely. I just want to give you a link to some example code written in C that I used to communicate with the TMP102 from my Raspberry Pi through its I2C ports - http://bit.ly/X8xZGi Hope it's helpful! 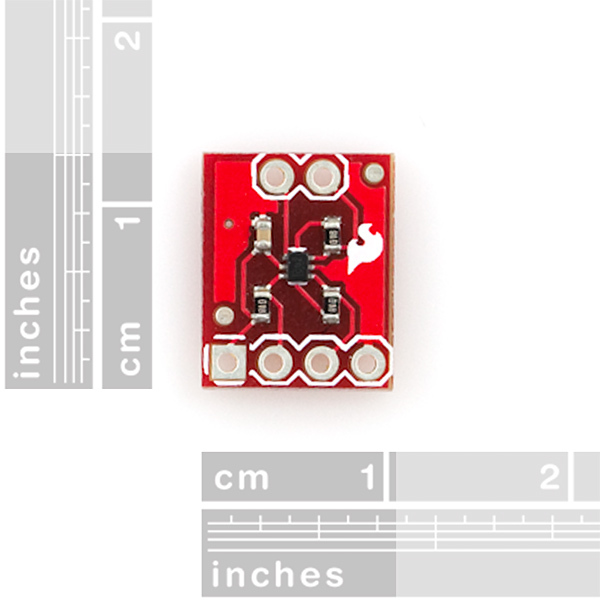 How do I get this board to work with a Sparkfun Pro Mini (5V)? It works just fine on an Uno. I'm using a voltage divider to reduce current on V+ to 3.3v. I'm guessing that it has to do something with needing to add pullup resistors on A4 and A5 or possibly converting the current to 5v on A4 and A5, but can't seem to find a wiring diagram on how to do that. 1.) Created a voltage divider using a 10k and a 22K resistor to convert 5v down to 3.4 v. (for VCC on the TMP102 breakout board) This is just a temporary solution since I didn't have a 3.3 voltage regulator handy. 2.) Soldering wires to the unpopulated A4 and A5 pins on the Pro Mini and adding a 1K pull up resistor to each pin. I connected the pullup resistor to the 5v power supply. It wouldn't work connected to 3.3v. Replace 0x48 with your address and tmp102 with whatever chip you have. I don't have the 102, but have a bunch of TMP100's I sampled a while back that work perfectly with this setup (using 'tmp100' instead of 'tmp102'). Here's a perl script I made for use on the Raspberry Pi using the Adafruit Occidentalis OS. Just wondering if you've scripted something in perl to account for temperatures below 0Âº C. Trying to hash out a solution but having a hell of a time. I'm having trouble getting this to work with an Arduino. I have hooked it up to A4 and A5, and I have it on the 3.3V power supply with the reference pin tied to ground. When I use the Bildr code to try to test it, I'm only ever reading values of 0 from the device. that is, I will get a temperature reading of about 0.0625 degrees celcius no matter what. This is my first time using I2C, so I might have made some stupid mistake, or I could have a bad chip, who knows. Any help anyone can give would be awesome. Thanks! Sorry to hear you are having troubles with this. It sounds like you have everything hooked up correctly and unless you are getting any weird errors from the code, shouldn't be having trouble there either. Check your sensor to make sure there aren't any shorted pins or damaged components and double check your wiring matches. If you still have trouble with it, let us know at techsupport at sparkfun dot com and we can help you out. 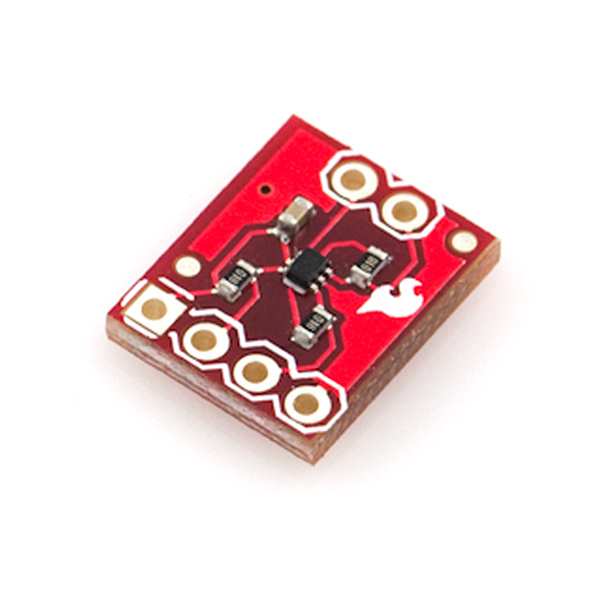 Has anyone used this thing with an MSP430?? 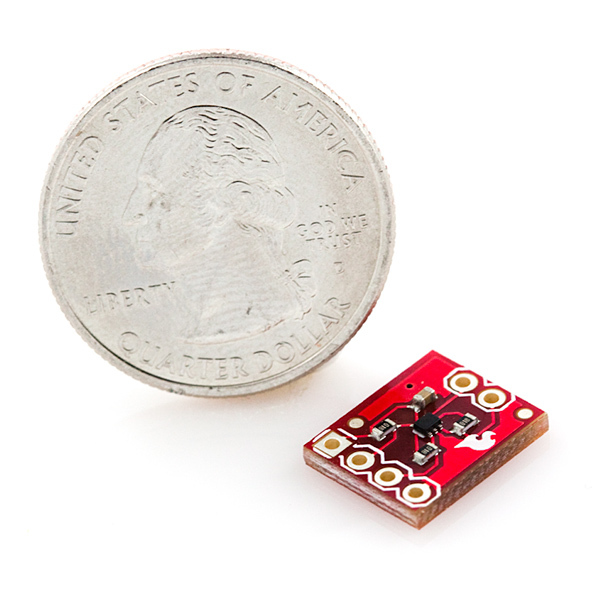 I'm trying to incorporate this sensor for a project. I'm using an MSP430 F169 on an Olimex development board. I already have an LCD working and displaying calculations based on the closures of two reed switches. I'm using Code Composer Studio V5, and I haven't been able to read anything from the sensor. I have the I2C interface set up, and have been messing with all kinds of things, from addressing to timing, but I, for the life of me, cannot read a temperature. 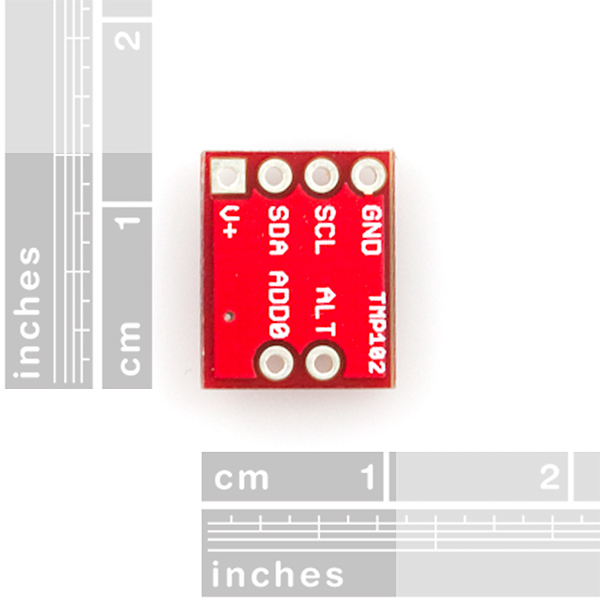 If this temperature sensor outputs a digital signal why is it connected to the analog inputs of the Arduino? That is a great question! The answer is that most of the I/O pins on modern microcontrollers can be used for multiple purposes. Those particular analog pins are also used by the ATmega's I2C ("Wire") bus interface. When you use the Wire library, those pins cease being analog inputs, and are instead used for I2C communications. See the Arduino site's Wire library reference page for more information. Yep, I2C is designed to accommodate multiple devices on the same bus, as long as all the devices have different addresses. The ADDR pin on this part allows it to be set to one of four possible addresses (see the datasheet on how to do this). So as long as you configure each one to have a different address, you'll be able to talk to four of them on the same bus. Can the TMP102 be used with DEO-nano from terasic? Is there example assembly code for the TMP102? Thanks. Argh! :) Been banging my head against this device for months now and i can't get it to work in LabVIEW with an Arduino for the life of me. If anybody has this TMP-102 working in LabVIEW can you PLEASE post a link showing how you did it? The chip is in the exact middle of the board. Though it is a trivial task, I figured that many people new to this sensor would look here for info as I have. To get an output in degrees F, someone going by the conversion formula might attempt to do ((Counts * 0.0625) * 9/5 + 32), but that will give you an incorrect result. The proper way is to first shift the Â°C/count scale to a Â°F/count scale, and for this step you must leave out the "+ 32" part of the equation. Only after you have multiplied your raw data by the 0.1125Â°F/count (0.0625Â°C/count * 9/5) scale factor do you add the 32Â°. The correct equation is therefore (counts * 0.1125) + 32. Trivial, but hopefully will save someone a few minutes of confusion. I used the code from the wiring example posted. If you use an integer to store both the high and low bytes from the sensor to represent temperature, make sure you clear the 4 most significant bits (15:12) after doing a two's complement conversion for negative numbers. Otherwise you will get incorrect (and frustrating) results. Keep in mind this is for a 12-bit temperature data format. Oh, man... I was just about to buy a couple of these. Any idea when they will be back in stock? And they reappear!! Thanks Sparkfun! Why not make a breakout board for the TMP275 instead of this particular chip? Though the low current and large range are appreciated in this case, it's voltage requirements are different than that of the vast majority of micro-controllers out there. It adds just a little more unneeded cost and complexity to circuit design. I can buy the TMP275 in a breakout board elsewhere, but I'd rather just get everything I need here. Does this work in Standard mode? Has anyone hooked one of these up to an arduino? I have an Arduino duemilanove, and have the tmp102 working. I connected V+ to the 3.3v pin on the Arduino board. Ground and Add0 to ground. SCL to analog pin 5, and sda to analog pin 4. The Alt connection is not needed. Here is my code, to read the sensor and print it through the serial port. I hope it helps. @futzle: I borrowed your snippets of code. They, and the rest of your comments helped a lot. Thanks! Would anyone know of a fix for this? How may I fix this error and have I included the correct library? If anybody has an idea of why this is happening, I'd appreciate any comments. The #include should read: "lt"wire.h"gt". I'll send the code to sparkfun and may be the'll post it as one of the documents. There may be other missing lines or characters. futzle: I contend that connecting A0 to GND (72) or V+ (73) are the only reliable options. I'm not even convinced of this any more. With A0 wired straight to V+, my TMP102 was responding happily on address 72. Then switched to 73 spontaneously after a few hours. I'm going to stop fighting it, and wire A0 straight to ground. If I need another temperature sensor on my household I2C bus I'll have to look for a different brand. Futzle were you able to even read off of it? I was able to Start, send the address(R/W bit low), get the proper ACK, set the pointer to the temp register, got the proper ACK, Stop. Then I attempted to start, send the address (R/W bit high) to read by get an ACK of [clock high]:[sda low] during all clock pulses after that the sda is alway high. Am I doing something wrong. Do I have to put a delay between the ACK and then expecting the actual data bytes to be read? Yes, I'm getting readings off it right now, at address 72 now that I have A0 connected to ground. I don't bother to write to it first; it seems to respond to a slave read all by itself. tz: So, if I leave the A0 pin unconnected, it acts like it is grounded, i.e the address is 1001000? I'd say that the absence of an answer in the spec means "then don't do that". I lost a couple of hours today trying to talk to the TMP102. Figuring that with A0 in line with SDA on the breakout, I'd save having to cut the stripboard between the two pins. The datasheet puts that configuration at address 74. But respond it didn't. Only by accident did I find that it was listening on address 73 all along, as it is supposed to when connected to V+. I contend that connecting A0 to GND (72) or V+ (73) are the only reliable options. So, if I leave the A0 pin unconnected, it acts like it is grounded, i.e the address is 1001000? Or is it pulled up or something else? (Hard to tell from the data sheet - it doesn't say it requires a pullup, but then it doesn't say what it does if not connected to anything, only if connected to any pin but ALERT). A0 is pulled up by a 1k pull-up resistor. I gave this a try. It acts like it's grounded, but it's not really reliable. If you touch the board at all, it'll get confused and think it's tied to something else. Best to just solder a jumper to GND to be safe.